Nadra announced new jobs in Islamabad in February 2019. If you are from Islamabad and want to work in Nadra, then this article is only for you. Must be a Pakistani citizen to apply for a Nadra job. The National Database and Registration Authority have started its executive passport project for which it needs multiple candidates to fill up the available vacancies. Both male and female candidates are eligible to apply for the advertised posts. More than 50 jobs have been announced in Nadra by NADRA Pakistan. We are providing you with complete information regarding the new job of Nadra, if you like the article, please express your opinion. National Database and Registration Authority, Pakistan, is an independent and autonomous agency under the Ministry of Interior. More than 17,000 employees work in Nadra Pakistan. NADRA Pakistan Headquarters is in Islamabad. Your education should be MBA, MPA, MCS, MIT, M.Com, M.Sc, MS, MS (IT) BBA / Bachelor in (CS, CE /IT, Telecom, SE, Eng) 4 years or equivalent degree. You should be between 22 to 35 years of age to app for Nadra's job in 2019. How To Apply for NADRA Islamabad Jobs 2019? The wishing candidates should send their applications to the address below with the CV, attested copies of educational certificates, experience certificates, CNIC, domicile, mobile phone number. 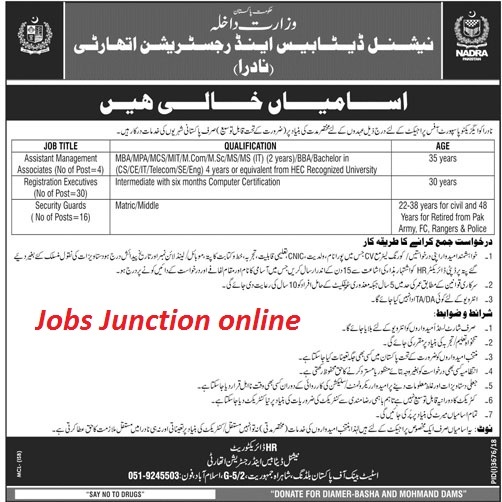 HR Directorate National Database & Registration Authority, State Bank of Pakistan Building, Shah-are-Jamhooriat, G-5/2, Islamabad.